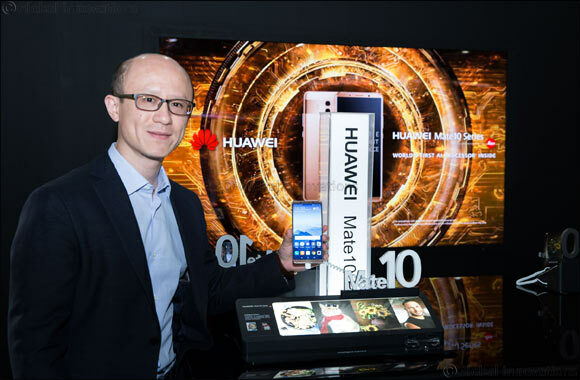 Dubai, United Arab Emirates, October 31, 2017: Huawei Consumer Business Group (CBG) has unveiled the world’s most powerful AI flagship smartphones – the HUAWEI Mate 10 Series in the Middle East & Africa region. Heralding a new decade of smartphone development, the new HUAWEI Mate 10, HUAWEI Mate 10 Pro and PORSCHE DESIGN HUAWEI Mate 10 devices are set to deliver the ultimate intelligent experience for regional consumers by providing more comprehensive mobile intelligence through Mobile AI. The HUAWEI Mate 10 Series goes beyond smart, using the AI application ecosystem to make the smartphone so intelligent with personalised AI applications that it completely changes smart applications and delivers a faster, stronger and seamless smartphone experience to users. Built with the world’s first AI processor for smartphones, the HUAWEI Mate 10 Series predicts its most efficient mode, optimizing performance to keep the phone in prime condition and deliver all-round greater efficiency, with more power, at higher speeds. The Huawei Mate 10 is available for purchase at the Huawei brand store located on level 2 at The Dubai Mall and across leading retailers. Huawei Mate 10 64 GB is available in Mocha Brown and Black colors at a price of AED 2,299 while Mate 10 Pro 128 GB will be available in Mocha Brown, Titanium Gray and Midnight Blue colors at a price of AED 2,999 from end of November. Mate 10 Series comes with Mate 10 Care offer that includes an initial 6 months screen damage warranty service available at all Huawei Service centers across the UAE. Mate 10 Care program also includes 1 time free engraving service and device sanitizing.